I needed an easy win - a dessert 'Hail Mary' so to speak. With only hours until my dozen guests arrived for Christmas dinner I just realised I forgot to purchase cream cheese for my cheesecake recipe!!! Worse, it was Christmas day so no grocery stores were open! With a dozen people on the way, I needed something crowd pleasing and simple.... fast. This recipe has few ingredients, requires no baking, can be prepared in 15 mins or less, and is simultaneously decadent and light at the same time. I received lots of praise for this simple recipe and find it less heavy than traditional cheesecake recipes. 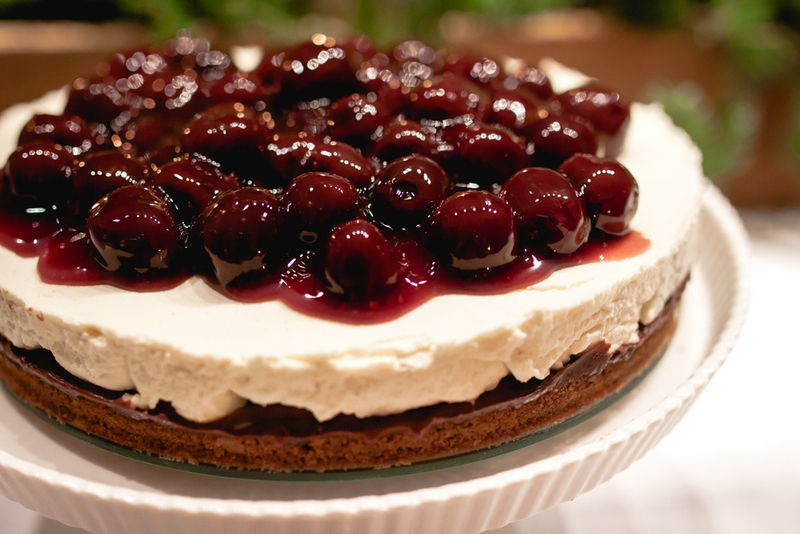 The crumbly ginger cookie crumb provides a nice kick in contrast to the lightly tart cheesecake, rich sweetness of the fudge, and sweet, smooth cherries. The blend of textures will entertain their mouths. Toss melted butter with gingersnap cookies. Press into the bottom of a lightly greased 8" springform pan. You can grease it easily and quickly with cooking spray. Place in the fridge to chill while you prepare the filling. In a medium bowl combine whipping cream, lemon juice & zest, vanilla and icing sugar, and beat until whipping cream is firm. Fold in the mascarpone cheese gently. Spread the contents of the Hot Fudge Sauce over the crumbs and smooth out with a bent edge spatula. Pour cheese mixture into the springform pan and smooth out. Cover with plastic wrap and leave in the refrigerator to set for 3 hours. Before serving, top with Cherry Pie Filling. It's important you purchase a high fat whipping cream. I'm not confident it would set with regular whipping cream. The 36% and 38% whipping creams whip up stiffer. We're basically making a 'ghetto' chantilly cream cake here. I used some of my home baked holiday cookies for the ginger snaps but you can use store bought ones instead to save time. Here is the recipe for the ginger cookies I made. The fresh ginger's spiciness accented the other flavours of the cheesecake. I used Vanilla Bean Cherry Pie Filling that I had put up in the summer. This made life alot easier. Feel free to substitute for your favourite compote. If you wish to make this filling from scratch to use in this recipe make sure it's cold so it doesn't melt the mascarpone cheese filling. Wash your lemons before making your rind. Lemons have a lot of pesticides. Cut with a clean, hot knife for best presentation. This cheesecake can be made up to 3 days ahead.